Looking for tires near you in Wilson? Firestone Complete Auto Care can get you back on the road with the best tire brands. Visit our shop to find your tires today! When it's time for new tires, Wilson Firestone Complete Auto Care is the best place to go. Whether you drive a car, truck, minivan, or SUV, we'll hook you up with tires for less. 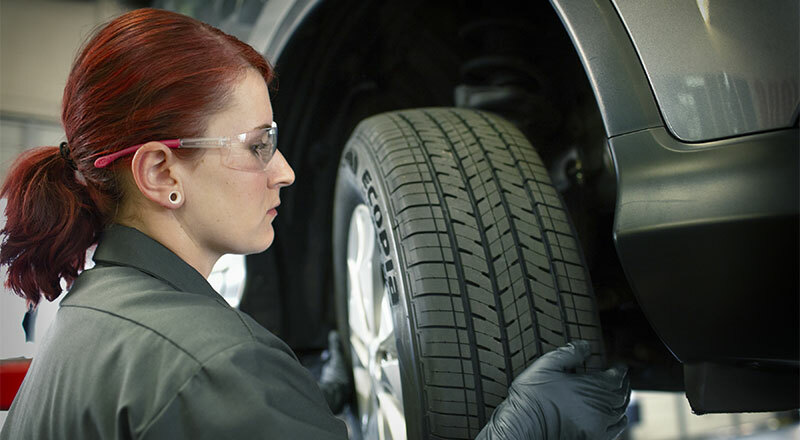 Our technicians will help you settle on the best tires for your driving style, climate, and vehicle. Shop our huge tire catalog online and learn more about world-renowned brands like Firestone and Bridgestone. Then visit your nearest shop for best-in-class tire installation. From performance tires to reliable all terrain tires, your nearby Firestone Complete Auto Care will keep you rolling with the right wheels. Unsure if it's time to change your tires? We've got knowledgeable technicians ready to help, but you can do a little research in your driveway too. First, check your current tires for tread wear. If the treads are barely noticeable, your tires might struggle to grip the road safely. That's a safety problem! Watch out for deep scrapes, bumps, bulges, or cracks in the tire sidewalls, and make note of the tire age. Even if your tread wear looks fine, most car manufacturers suggest having new tires installed every 6 to 10 years. It can be a safety concern, a main priority for us at Firestone Complete Auto Care in Wilson. Set a course for a cross-country adventure or a more fuel-efficient commute with the best tires for your car from Firestone Complete Auto Care. We'll hook you up with the size you need from the most trusted brands, including Bridgestone, Firestone, and Primewell. Put your car in our care and we'll deliver more than expert advice and tire installation. We'll also provide you with free pressure and tread checks, along with reliable flat tire repair, alignment, and rotation. We've been a choice tire shop in Wilson for a long time, and a leading tire provider in this country for almost a century. For experience you can trust, choose Firestone Complete Auto Care. Browse tires online and schedule your installation today! From drivetrain services to alignments to headlight replacements, head to a Firestone Complete Auto Care near you for your car repair and maintenance services. We're your all-in-one tire store, car care center, and automotive shop. Our highly qualified technicians believe in truly complete auto care. Regardless of the maintenance your car or truck needs, we promise affordable prices and exceptional service. Experience the difference! Make an appointment for auto service in Wilson, North Carolina today.